Richmond's newest focus group facility, Dominion, was designed for your comfort and convenience. Our three unique focus suites can accommodate groups of all sizes and purposes. High-tech video and audio equipment, as well as professional camera personnel, are available for your use. Click on an area of the image above to view each room. 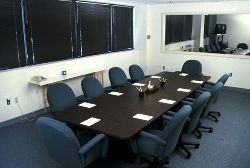 The Washington Room is our largest suite with executive style chairs and an extended conference table that seats 10. When set up in class room style the room accommodates up to 35 respondents. Windows that stretch the entire length of the room and overhead lighting allow for plenty of brightness. All writing tools, overhead projection equipment, and video and audio resources are available for your use. The Wilson Room is our elegant raised platform style observation suite to the Washington Room. Directly in back of the one-way mirror are our two-tiered writing counters supplied with supplementary lighting and writing tools. 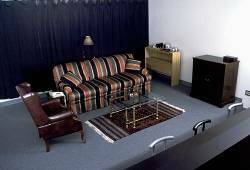 The room features closed circuit television and two sets of overhead speakers front and rear. Just behind the writing counters is a spacious lounge and a refreshment area. The Jefferson Room consists of a fully equipped modern kitchen. A glass table comfortably seats eight people and is centered in front of the one-way mirror. The room is used by our clients to test home products, packaged foods, beverages, etc. The casual environment allows for very effective and informed focus groups. The Monroe Room is the observation room for the Jefferson focus suite. 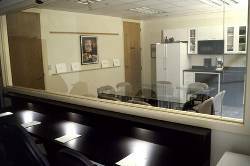 In back of the one-way mirror is a writing counter that seats six with the option of accommodating up to twelve observers. Video and audio equipment and writing supplies are provided for your convenience. The Harrison Room is our smallest and most intimate focus suite. A small conference table seats six people, and all equipment is provided. 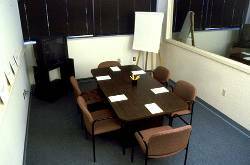 This suite is used for mini focus groups, triads, dyads and executive one on one interviews. The Tyler Room is the suite used to observe the Harrison Room, and it can accommodate up to eight people. It contains a writing counter for five, all writing tools, refreshment area and recording devices. 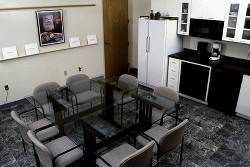 Finally, as an added convenience, we offer a separate, private office exclusively for use by our clients. It is furnished with a personal desk, computer, copy machine and telephone. ©Copyright 2000 Dominion Focus Group, Inc.